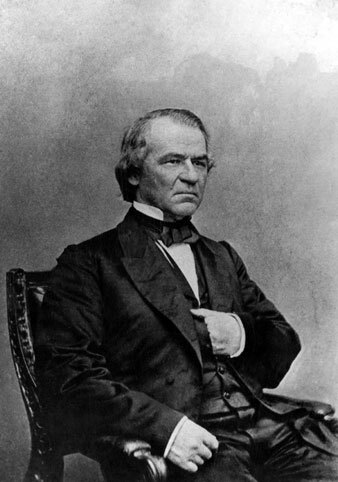 Americans exercise their good sense by not caring much about the impeachment of President Andrew Johnson. ….Owing to a combination of circumstances, the trial has produced absolutely no excitement in the public mind. All attempts to make it “sensational” have failed utterly. The attitudes, the speeches, the evidence have been listened to by the country with perfect calm. It has been found impossible to work people up into anything like fervor about the case. We hear of “tremendous pressure” being brought to bear on the Senate in favor of conviction, but it is not organized pressure from the party at large; most of it, we suspect, comes from individual politicians in search of places. There has been no perceptible addition to the mails, in the shape of letters from imperious constituents; and if there have been any prayers offered up for the President’s condemnation, they have been private prayers. The natural consequence of this absence of excitement, for which, let us add, we have to thank not the politicians or newspapers, but the popular good sense, has been the absence of any disturbance in business or in society. Had the public risen to the same height of moral exaltation as the original impeachers and the Washington correspondents of the party organs, few of us would have passed many nights in bed during the last two months, or had either heart or head for the care of our private affairs. But, owing to the general coolness, not only has the Senate been enabled to conduct the trial with fairness, dignity, and decorum, but the world of trade and commerce has enjoyed unwonted repose. Gold has declined; business has, if anything, showed signs of revival; and owing to the concentration of the attention of the House and Senate on the trial, a temporary stop has been put to the attempts to tinker currency which were so common during the winter. The natural result of this general repose has been to deprive the impeachment, in the public eye, of most of its obnoxious features. Although we are satisfied few, if any, of those who before it was commenced thought it inexpedient, now think differently, nobody considers it as dangerous as he once did. Moreover, enough has been brought against the President to make an otherwise harmless attempt to convict and remove him seem reasonable and justifiable. People say to themselves that if impeachment involves no more disturbance to the body politic than this impeachment has so far caused, the House cannot be very much blamed for trying it, even if it results in nothing. So that even if the party has been unwise in taking the matter up, it has more than atoned for its want of wisdom by its manner of conducting the process…. There is another reason for thinking that the public is now not only ready to forgive the party for bringing the President to trial, but will probably be disappointed if he is acquitted, and that is, that what it most disliked about impeachment was the beginning of it. Having been begun, whatever mischief it can do has been done. It is doubtful, therefore, whether people will not be sorry now if, after what they most feared has come to pass, the process does not end in getting rid of the author of all the mischief. Mr. Johnson minus impeachment is bad enough; Mr. Johnson plus impeachment would be worse still. He would not only, as we have said, put a wrong construction on his escape, but he would, knowing that he had nothing more to fear, probably take a more active part in the approaching campaign than any President has ever done before him; and it is not impossible even that he would sing songs of triumph on the stump throughout the summer. The only thing that reconciles anybody to this prospect is the looming up of Mr. Wade on the horizon. But Mr. Wade, it is right to say, has displayed, since the trial commenced, a great deal more discretion and delicacy than was expected of him, and even promises to afford the world a shining example of magnanimity in not taking part in the final vote. He also, it is said, steadily repels all applications on the subject of places. At worst, his term of office will be too short and most of the active politicians too busy during his term of office arranging combinations for Grant’s advent, to make it possible for him to do much mischief, even were he mischievously disposed, and he is too honest and frank a man to take part in any intrigues for the embarrassment of Grant’s administration. There is one result of impeachment for which we fear a good many people are looking, but for which it is extremely desirable they should cease to look, and that is, the establishment of the reign of pure truth and pure justice through the length and breadth of the land in case of Mr. Johnson’s removal. So much heat of language is necessary in the present state of the world to carry on the work of popular agitation, that it is hardly ever carried on without exciting most extravagant expectations regarding the consequences of success. This has been peculiarly true of the agitation against Mr. Johnson. What with his own bad behavior and the fearful pictures of him drawn by his enemies, a great many good people have been worked into the belief that he is responsible for nearly every evil by which our society is afflicted, and that once he is removed there will be nothing but harmony and tranquility and prosperity within our borders. Now, there is no doubt that his removal will do something to promote these things, but not very much more, we fear, than the election of General Grant next November. In spite of all we hear on the stump, human nature remains human nature, and “man,” as the young ladies are taught in fashionable seminaries, “progresses by gradual stages.” We say this, not by way of dampening people’s reforming ardor, but by way of quickening it; by way of reminding them that the world is not made much better by occasional strokes or “jumps ahead”; that there are no political or social “pain-killers” or “ready reliefs”; that the real instruments of progress are religion and education; and that unless the removal of Andrew Johnson is followed by a higher regard for character in public servants, we shall be laughing ten years hence over the fuss that has been made about him. The taking of the verdict in the impeachment case is postponed until Saturday—unfortunately, as we think, because it keeps the country so much longer in suspense, and because it give three days more for the play of corrupt influences on the senators. It appears very probable that the necessary two-thirds vote cannot be obtained on any one article. The latest calculation we have heard and that in which we place most confidence, gives twenty-two for acquittal, or three more than are necessary; and there is little doubt that the postponement is mainly due to the discovery of this by the majority, and their reluctance to give up all hope of a different result. The largeness of the vote for acquittal is probably due to the wide difference of opinion amongst senators on different articles. There are perhaps enough of them agreed that Andrew Johnson ought to be convicted, but they differ as to the articles on which the conviction ought to rest. On the strongest one of all, the second, those senators who loudly repudiated in the Senate at the time of the passage of the bill, the idea that the Tenure-of-Office Bill was intended to cover Mr. Stanton’s case, of course will vote for an acquittal. They could not vote otherwise on that article without, as Mr. Stevens says, consigning themselves to “a gibbet of everlasting obloquy.” Of course many articles have lost all importance whatever—the tenth, for instance. That has been ruined by the Donnelly-Washburne “difficulty” and the Butler-Brooks “difficulty.” If report speaks truly, too, the largest vote in favor of conviction will be on the second and third articles, which Mr. Stevens has pronounced of absolutely no value. In fact, the indications now are that instead of the Republican senators voting en masse for conviction, several will vote for acquittal, and amongst them Fessenden and Trumbull. What has most contributed to this unexpected result it is difficult to say; it must be ascribed to a variety of agencies, no doubt. One reason why it is unexpected is that the Washington correspondents, and the more uproarious Radical newspapers, never could or would believe that the process was a judicial trial, or that the Senate were sitting for any other purpose than the execution of the party will. They therefore have trained themselves into considering a vote for acquittal as a piece of political treachery, of which no ordinarily prudent man could be guilty. The main cause of the result itself we hold to be an honest difference of opinion, on the part of men of legal training, as to the nature of very obscure and ill-defined offences, as to the interpretation of the articles, and as to the force of the evidence—differences such as we see occurring every day amongst men of education, on all sorts of subjects. Another agency which has no doubt contributed to the result is the disgraceful language of some of the party papers—notably the New York Tribune, and of a portion of the Managers. The American Senate has hardly yet sunk so low as to contain no man whose spirit was not roused by the unparalleled threats and bullying of which it has been made the object. Some allowance, therefore, must, we think, be made for simple irritation, in enquiring into the causes of the split in the Republican vote. We are bound to add that the widespread hostility of the senators to the Honorable Ben Wade has also had something to do with it. We do not defend their want of elation at the prospect of seeing this great and good man elevated to the presidential chair, all the less, because they themselves, in a moment of wretched panic, put him on the road to promotion. We simply state the fact; we leave it to others to characterize it, begging them to remember, however, that senators are human. The Senate has again voted on the impeachment articles—this time on the second and third—and with the same result as before. It has now adjourned, as a court, sine die. We shall, therefore, hear no more of impeachment, and we are glad of it. After what has happened, a verdict of guilty could have had no moral weight. The first adjournment of the court not only deprived the process of all value, but converted it into a national scandal and disgrace. The less said about it now the better, but we hope if there have been any attempts to bribe they will be ferreted out and the authors punished. The Butler investigation has thus far fastened suspicion on two of those who voted for conviction, a circumstance which we trust will not delay or impede enquiry. But no censure or punishment will be complete which does not reach the Missouri delegation, General Sehenck, and the author of the Kansas telegram to Mr. Ross. The punishment of these last three offenders ought not to be so severe, perhaps, as that of bribers in money, but ought not to differ in kind. Secretary Stanton’s resignation was inevitable after the President’s acquittal, and was not delayed. The position in which he now finds himself is such as every Republican must regret, and is one of the most unpleasant consequences of the confusion caused in the public mind by the Tenure-of-Office legislation…. The committee appointed by the House to investigate the charges of corruption made against certain Senators in connection with the impeachment trial has been pursuing its labors through the week, and made its report, through Mr. Butler, on Monday. Owing to the fact to which we drew attention last week, that only one side is represented on the committee, all persons opposed to impeachment being excluded from it, and that it is composed exclusively of gentlemen whose political fortunes and reputation are dependent in a great measure on the President’s conviction, and whose passions as against him, and all his friends and supporters, have been strongly excited by the events of the last few weeks, the enquiry is wanting in all the characteristics of a judicial investigation. There has been no cross-examination of the witnesses; the evidence to be produced has all been selected by Mr. Butler and those who feel with him. He has seized the telegrams in the Washington offices, produced such as he pleased, and suppressed such as he pleased, and has, in fact, in his report, regulated the light thrown on the evidence in such manner as suited him. We say this not for the purpose of insinuating that he has not discovered any facts of real importance, but for the purpose of preventing the public from even allowing him to suggest inferences. He is to be trusted just as far as his facts go, and not one hair’s-breadth further. He promised monstrous revelations with regard to Mr. Johnson’s crimes, when the great impeachment investigation was set on foot a year ago, but, as our readers may remember, when the report made its appearance his hints and insinuations were found to be quite baseless.